A couple of days after his unarmed teenage son was shot to death in a dispute over loud music, Jordan Davis’ father received a text. “I just want to welcome you to a club that none of us want to be in.” It was from Trayvon Martin’s father. The club has since added a few more unwilling members, African-American parents who wonder how their children can be gunned down and their killers not held accountable. So Marc Silver’s wrenching documentary “3 1/2 Minutes” couldn’t be more timely, even if we happen to remember the details of the case. If you recall Davis was sitting in his car with three other teenagers at a Jacksonville, Florida gas station, blaring rap music on the car stereo. Richard Dunn and his fiancee pulled into the spot next to them and, as his fiancee went inside for a bottle of wine, Dunn asked the teens to turn the music down. What happens next is matter of dispute. Dunn says that Davis grew increasingly belligerent and threatening, finally displaying what Dunn thought was a shotgun barrel out the car window. Dunn pulled a pistol from his glove compartment and fired 10 shots at the car, killing Davis. The three surviving teens said Davis may have disrespected Dunn, but never threatened him. And there was nothing in their car that remotely resembled a shotgun barrel. 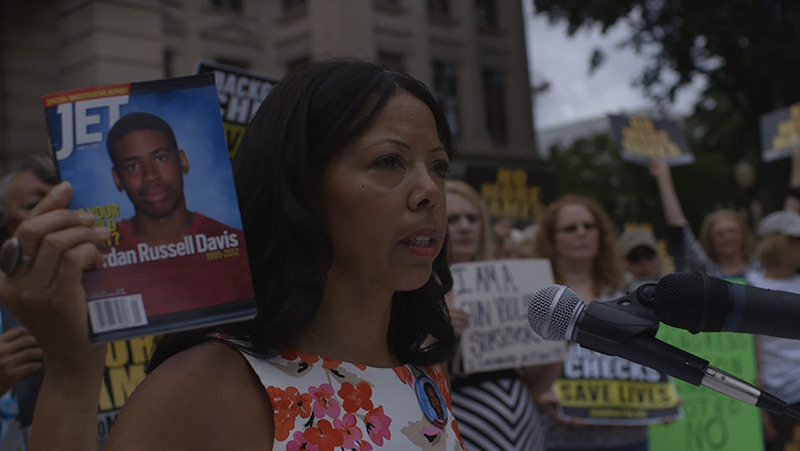 Silver’s film follows the riveting trial of Dunn, who was claiming self-defense under Florida’s “Stand Your Ground” statute, which essentially allows someone to use deadly force against a threat, even if it is merely a perceived threat. The question is, how does the law apply if white Americans always perceive African-American teens as a threat. Silver (“Who is Dayani Cristal?”) makes extensive use of the courtroom proceedings, and views most of the film through the lens of Davis’ grieving parents. But I think the film has enough compassion to go around; I even felt a little for Dunn himself, a big, soft guy who clearly loves his girlfriend and his puppy. But he was also deluded about the nature of the teens and his own prejudices, and, unfortunately for everyone, he lived in a state with laws that reinforced those delusions. “3 1/2 Minutes” would have been stronger if it had provided a little more context — the larger issues in the case are represented mainly by clips of talk-radio chatter that play throughout the film. But it’s a sobering film that goes way beyond the CNN “crawl” to show us the real people shattered by a single, terrible act.